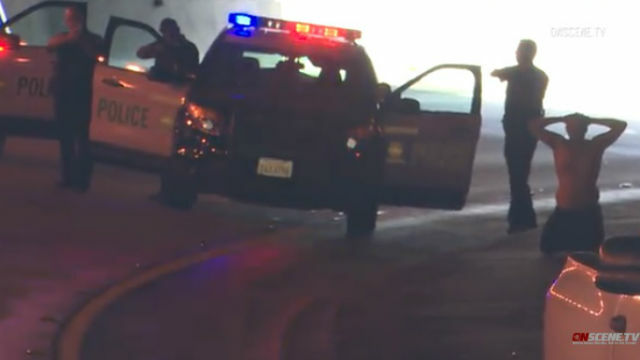 A driver in a stolen car led officers on a pursuit through Chula Vista Saturday before officers were able to apprehend him in a tunnel, an officer said. Photo via OnScene.TV. A driver in a stolen car led officers on a pursuit through Chula Vista Saturday before officers were able to apprehend him in a tunnel, an officer said. Police received information Saturday morning that a car had been stolen from El Cajon as part of a burglary, and officers were notified before 10:15 a.m. that the car had been spotted at a home near View Park Way and East Palomar Street, Chula Vista Police Lt. Rusty Rea said. The car left as officers were heading to the house, and a pursuit ensued, with the driver leading officers north onto state Route 125, Rea said. Officers soon backed off as the driver continued to proceed recklessly on the freeway and allowed a police helicopter to keep an eye on him, he said. The car entered the tunnel on the transition road from northbound Route 125 to westbound Route 54 and the helicopter crew did not see it come out the other side, Rea said. Calls from passers-by confirmed the driver had stopped the car inside the tunnel and was trying to get away on foot. Police closed the tunnel and were able to arrest the driver, identified as 25-year-old David Felix.